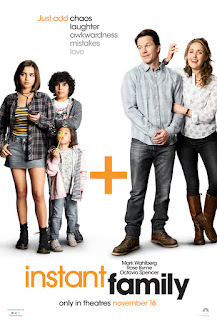 I didn't expect much from "Instant Family," a comedy about a childless couple (Mark Wahlberg and Rose Byrne) adopting a teenage girl and her younger brother & sister. The movie presents a heartwarming comedy, genuinely funny & touching. Wahlberg and Byrne attend an adoption picnic. They meet Isabela Moner, a 15-year-old Latina, who gets their interest by calling them out. Soon, the couple takes in Isabela (as Lizzy) and her siblings. All does not go well, but with the help of social workers played by Octavia Spencer & Tig Notaro, things ultimately come together. "Instant Family" has the advantage of a stellar script. The laughs and emotional heartstrings left me in a puddle. "Instant Family," 3 stars, rated PG-13. Does it deliver what it promises? Family-friendly holiday comedy. Is it entertaining? Very funny and touching. Is it worth the price of admission? A movie for everyone.